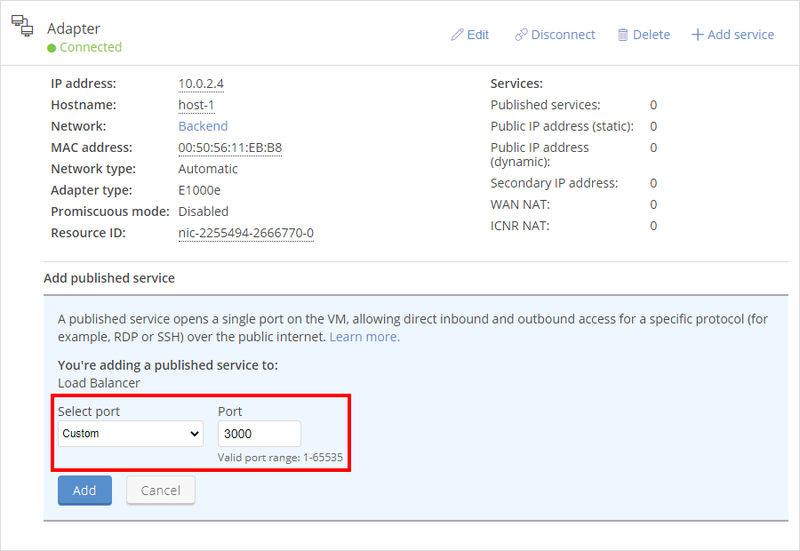 Navigate to the VM Settings > Network Adapters page for the VM you want to edit. Click (Settings) for the VM you want to edit. If the Settings button is not visible, you do not have permission to edit the VM settings. Work with your instructor or Skytap administrator to edit these settings. The VM Settings page displays. The Network Adapters tab is selected by default. Attach the VM to the automatic network. The Add published service window displays. Either select from the common connection methods in the By name menu, or type a custom port number in the By port field. Skytap creates a published service with an internal port number and a public address. The Internal port is the port you selected to open in the previous step. This is the port used by the VM application or service. The Public address is the URL exposed on the public Internet; use this address to connect to this VM. For more information, see Connecting to a VM using a published service. Configure the VM to support the remote connection. The specific requirements vary, depending on the port and application you’re connecting to. For example, to connect with RDP, remote access must be enabled on the VM. For some applications, the VM firewall rules may need to be edited to allow traffic over the port you are publishing. For help with RDP, see Accessing VMs with direct RDP. For help with SSH, see Accessing VMs with SSH. For information about the IP addresses and port ranges used by published services, see What IP addresses and port ranges does Skytap use?